All dining aboard Orion is included in the cruise fare. Most meals take place in the Constellation, the main restaurant on Deck 3; when weather is fine, meals might be served on the Deck 4 outdoor cafe at the back of the ship. Most tables in the Constellation are large, which encourages passenger socialization. Even on longer voyages, there is considerable variation in menu offerings and themes. And, menus offer vegetarian, gluten-free and sugar-free options though it's recommended that those on special diets let the line know beforehand of any particular needs. Constellation Restaurant (Deck 3): This is the signature dining venue aboard Orion. Tables seat anywhere from four to 12 people in single, open seating; the maitre d' will assist you in finding a seat to save you scouring the room self-consciously for a place. Breakfast is served buffet-style, with a range of hot dishes, omelets prepared a la minute, cereals, cold cuts and cheeses. Lunch is also served buffet-style, and includes a nice range of cold salads, soups, grill selections, hot dishes and a dessert spread. Dinner is a highlight, with table service and extravagantly varied menus that offer something for everyone. Menus are created by famed Australian chef Serge Dansereau of the Bathers' Pavilion, and each night include a multicourse tasting menu, and a number of alternatives. On one evening, the Dansereau tasting menu consisted of a goat cheese tart, followed by monkfish medallions and a passion fruit tart. Passengers can opt for the alternative menu, which on the same evening featured pasta with prosciutto cream, cauliflower soup, salad and a choice between a haddock filet and lamb cutlet. Or they can mix and match. At lunch and dinner, wine and beer is poured on a complimentary basis. Outdoor Cafe (Deck 4): Located at the very rear (stern/aft) of the vessel, this buffet venue is typically used for breakfast and lunch when conditions permit -- as an alternative to the Constellation. Menus are similar with buffets at breakfast and lunch. There are more tables for two out here (along with group-style seating as well) and passengers also can choose to take their plates into the adjacent lounge, which has a handful of dining-height tables. 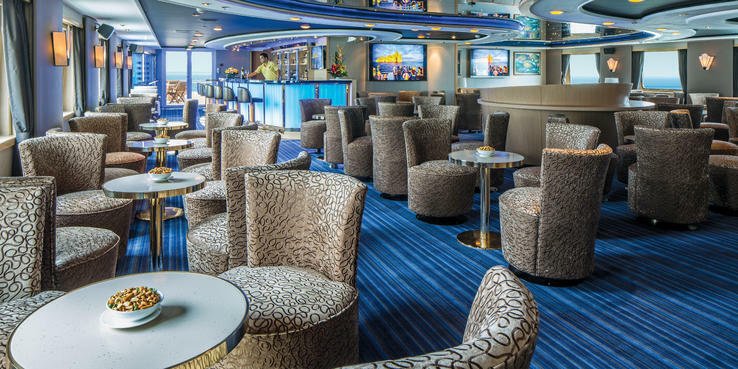 Observation Lounge (Deck 6): Light snacks, such as cookies, fruit and pastries, and beverages such as water and soda, are available here 24/7. There is no room service on National Geographic Orion, unless by special request.